Brian Cox is one of those unassuming actors that made his name in the theatre before breaking into the crazy world of Hollywood. Growing up in Dundee as the youngest of five children, Cox joined the Dundee Repertory Theatre at the tender age of 14 before going on to drama school in London at seventeen. His years of acting experience and deep, smooth voice make him one of the most sought after actors of his generation, and the sheer length and diversity of his filmography attest to that. One thing many don’t know about Cox is that he was the first actor to portray Hannibal Lecter on screen, in Manhunter (1986). The role came about with a stroke of luck, “I did a play on Broadway called Rat in the Skull where I played an Irishman. It was a huge success and a woman who had come to see me interviewed me for Manhunter.” His booming voice helped greatly as he was told to face away from the casting agents when auditioning; he got the part. As a proud Scotsman, his featuring in the 1995 films Rob Roy and Braveheart were personal highlights. In the latter Cox played Argyle Wallace, uncle of the main protagonist William (played by Mel Gibson.) “I had played William Wallace in a TV drama about twenty years before that in the early 70s called Churchill’s People and I kind of knew about him. He actually went to school in my hometown and committed his first crime there by killing a 14 year-old boy.” Cox notes that the film itself was “marvellously made” and heaped praise on his co-star and the film’s director Mel Gibson. Cox is currently appearing in a West End adaptation of Conor McPherson’s award-winning play The Weir. McPherson actually began writing his first plays as a member of UCD DramSoc when he was a student here. The play also stars Peter McDonald, an actor who graduated from UCD in 1994 and was also a member of the college’s dramatic society. The play is currently selling out at London’s Wyndham’s Theatre; Cox plays an old garage owner called Jack Mullen, a character he describes as “one of your old bachelor types, a bit of a hard drinker and very much a kind of livewire.” He himself describes the play as funny but moving, and since its inception in 1997 the Royal National Theatre in London saw it voted in a poll one of the 100 most significant plays of the twentieth century. Brian Cox seems especially adept at balancing opposites; his Scots homeland with his Irish heritage, portraying evil with playing nice, and acting on stage versus on screen. Long may this great actor’s balancing act continue. 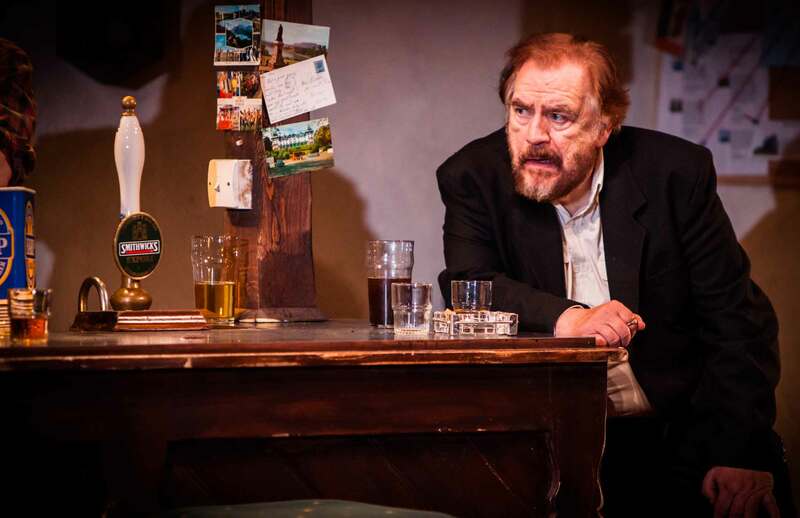 Brian Cox is currently starring in the West End alongside Ardal O’ Hanlon, Peter McDonald, Risteard Cooper and Dervla Kirwan in Conor McPherson’s play ‘The Weir’ at London’s Wyndham’s Theatre in a strictly limited season until April 19th.